Corn on the Cob is wonderful mid-summer but honestly; try adding some of this Cilantro, Honey and Chile Butter for Grilled Corn and it will go straight to amazing! Despite my children telling me I am; I ignore them because I am not THAT bossy! Still there are times and there are places and in this one I can not help myself. GO GET SOME FRESH CORN AND MAKE THIS BUTTER! There, I said it…do I need to yell say it again? It is so simple and it is beyond divine. Perfect even. Not overpowered by any one element, the notion of having corn without it now almost makes me cry. How sincere am I in these statements? The first night I made it a few weeks ago, I said no thanks to burgers, fresh tomatoes and potatoes for dinner. I had corn. All corn. Nothing but corn. THAT good!! OK maybe one tomato. I remember when we were kids that my dad would stop by a local farm on the way home from work and get a bushel of corn for ‘Corn Night.’ Nothing but net…I mean corn. Not one thing on that table but corn and tomatoes. Heaven. Now Heaven is corn with this butter. The best corn in Colorado comes from Olathe and it’s coming in droves…I’m OK with that. I’ll eat a drove of it with this butter. I was offered a sample of Golden Blossom Honey recently and it arrived the day I decided to make this corn. How perfect. This honey is nothing less than iconic. Created in 1929 by John H. Paton after his father, John G. Paton, had initially developed a bulk honey business on the West Coast. After several years of development, John G. moved the company in order to take advantage of prosperity and opportunities to be created in the Northeast. In 1932, the Golden Blossom brand was introduced to the public. It was not long before Golden Blossom Honey became a household name with market share reaching over 60 percent in the metropolitan New York market. I love that Golden Blossom Honey is 100% sourced from US beekeepers. It is comprised of three flowers – extra-white clover, sage buckwheat and orange blossom and is made between May and August of each year. I just love honey; but I really loved THIS honey. Take a peek at your market next time…it is worthy! Have I convinced you? I mean it…you MUST make this Cilantro, Honey and Chile Butter and then tell me you didn’t sneak some into your mouth from a spoon. Before I go…I want to mention two things. First…see those lovely tomatoes; grown by my daughter on her condo porch. Makes a momma proud! They are so good…she is VERY lucky she still has some on her counter. Preheat grill. 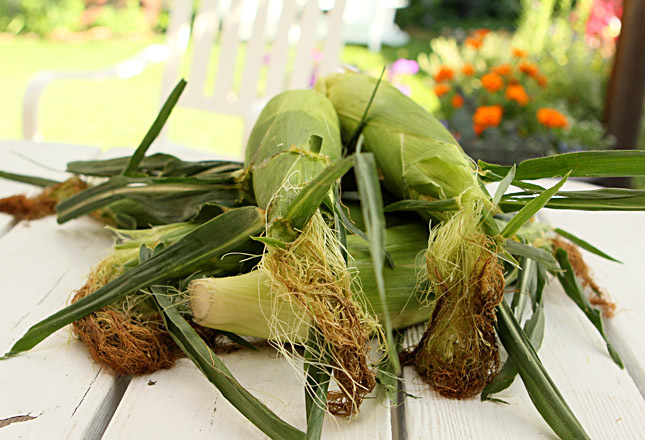 Place corn ears in their husks over low-burning coals (or over low heat on a gas grill) and cover the grill. Cook corn, turning occasionally, until it is tender, 35 to 45 minutes. Transfer corn (still in husks) to a serving platter. Meanwhile, heat 2 tablespoons butter in a small heavy skillet over medium heat until it is melted. Stir in chili powder and garlic and cook, stirring constantly, until garlic is golden and chili powder is fragrant, less than 1 minute. Transfer chili powder mixture to a food processor, then add honey, cilantro, remaining 6 tablespoons butter, salt and pepper, and pulse to combine. Transfer chili-cilantro butter to a bowl and serve with corn. Recipe from the Denver Post Food Section. I agree…your vote is the ONLY one that matters! At least when we are talking about something this delicious!! This looks and sounds so good I kind of want to weep, Barb. Dang! I can never get enough corn so I would love this grilled corn for dinner soon! I love corn..!! Especially grilled corn and according to this recipe I can prepare it easily at home. Thanks a lot for sharing this creative recipe. I am loving it. I don’t mind being told what to do when it looks this good! Hehe…that’s the spirit. And it’s good. Real good. What great looking corn! I have to try this. I make something similar with chili powder, lime, pepper, garlic, and butter. I bet the honey is excellent here. Corn and tomatoes are among the highlights of my childhood summers spent at the Jersey Shore. New Jersey doesn’t always get rave reviews but it deserves more credit for its summer produce. I’d love to try your butter on corn and will do so before corn season passes me by. We’re lucky in Missouri in that we can get tons of local honey – even the supermarket sells it! Grilled corn is so great, and I happen to have some I just got. I often do cilantro and lime, but will have to try the honey. Great pictures – terrific grills marks! Your corn looks perfect!! I love the cilantro, honey and chile butter!! Such a perfect summer staple! What beautiful corn. This is perfect time for this post with all of the Olathe sweet corn coming out of the field right now. I usually do the mayo, Parmesan, cilantro schmeer but this looks too good not to try. Give Em a high five for me on those tomatoes, they are gorgeous.